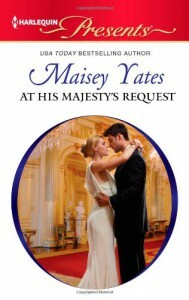 Rating: 4.5 StarsAt His Majesty's Request by Maisey Yates is book 2 in the Call of Duty series. Prince Stavros heir to throne needs to get married, and married quick so he enlist the help of professional matchmaker extraordinaire Jessica Carter. Why you ask? Well Stavros has a pretty logical explanation...“When I want to find a suit for an event, I hire I stylist. When I need to organize a party, I hire an events coordinator. Why should this be any different?” Stavros is not interested in love or emotions; he is more interested in finding the right Queen for his country and his people than he is to find himself a right wife. In his words:“I am not so much concerned about the art, Ms. Carter. The essentials are general compatibility and suitability for my country. Childbearing hips would help.” “Try this for a tagline—marry the jaded prince and receive a title, a small island, a castle and a tiara. That might make up for it.” As Stavros and Jessica begin to spend time together, there is chemistry and they can't help the budding attraction between them.Jessica married for love once but when things didn’t quite work out as they had planned her ex-husband upped and left, she still carries a whole load of baggage and insecurities from that relationship. Jessica knows she can never be the queen Stavros needs and tries to resist the temptation but Stavros know what he wants and what he wants is Jessica.But when Jessica reveals her darkest secret to Stavros, he cannot help but fall for this strong beautiful woman, now his biggest challenge will be to get Jessica to believe in them, to believe that they have a future together. This is my Fav. Quote from the book:But you, Jessica Carter, you are perfect for me. And I don’t care what you can’t do, I only care what you do for me, what you give me. I care that when I’m with you I’m a better man.Jessica was a great heroine and I think Maisey Yates did an awesome job staying true to Jessica’s character and her issues to the very end. If you have read Maisey Yates’s books you know the writing is going to be brilliant and the dialogues witty…and this one stayed true to form. At His Majesty's Request was an emotional read that had a lot of light hearted moments… I would highly recommend both books in the Call of dusty series. I can’t wait to read Xander Drakos story’s I know it’s going to be a good one!